As far as I know, Hillary Clinton never served in the military. However, she certainly seems to be familiar with the concept of an about-face. Let’s go back a few months ago, shall we? "When the phone rings, whether it's 3 p.m. or 3 a.m. in the White House, there is no time for speeches and on-the-job training," Clinton declared with a smile in front of a group of retired generals, admirals and other military types. Her military supporters rushed to answer the phone imagery. "Senator McCain will bring a lifetime of experience to the campaign, I will bring a lifetime of experience, and Senator Obama will bring a speech he gave in 2002." Given those remarks, does anybody actually buy this line of talking points offered on Friday? "To anyone who voted for me and is now considering not voting or voting for Sen. (John) McCain, I strongly urge you to reconsider," said Clinton, beseeching her supporters to join with Obama's "to create an unstoppable force for change we can all believe in." Huh. It seems that just three months ago there was nothing to believe in, Hillary. Now all of a sudden eloquent speeches, vapid slogans and on-the-job training are all the rage? 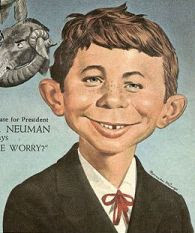 Or is the sudden shift in attitude due to the prospects of an Attorney General Hillary Clinton? I guess we’ll have to stay tuned! It's official! Laura will return to the radio airwaves on Monday, June 30. Buckle your seatbelts! If you’re at Interlachen Country Club in Edina today and happen to see a rather stout gentleman in his mid-60s taunting an 18-year old kid, don’t be alarmed. It’s merely Star Tribune columnist Patrick Reusse displaying schadenfreude over Michelle Wie’s performance at the ninth hole. Even though our new house won’t be done until October, we’ve had some very serious nibbles on our current residence. It wouldn’t surprise me if we received an offer by the end of this week. If an acceptable offer is made, chances are we’d need to be out of our house by July or August. Thankfully, my Mom has graciously offered to let us stay at her place until construction of our home is completed. Recently, I ran into an old friend of mine whom I hadn’t seen in nearly 15 years. When asked what I’ve been up to, I told him that my wife and I are currently very consumed with selling our house. Russ: Oh! How long have you been married? Me: It’ll be eight years on July 7th. Russ: And where are you moving to? *What???!!! You've never heard of the Billy Joel tune Movin' Out (Anthony's song)? What will it be like if John Edwards goes campaigning for the guy they call the “Obamassiah”? "If we do the work that we can do in this country, the work that we will do when Barack Obama is president, people like Christopher Reeve will get up out of that grave and walk again." What, is my blog some sort of grab bag? First, the Milwaukee Journal Sentinel gets credit for a post I wrote about the Brett Favre retirement in March. Now I find some sports guy stole my headline from that story. Check out this story from the blog Murtha Must Go. He was for public financing before he was against it. Did I not say before that John Kerry saw a lot of himself in Barack Obama? In addition to scaring senior citizens and attempting the “regular guy” bit, Obama can now add flip-flopping to his emulation of the failed ’04 Presidential candidate. Spygate: It's over; Now get over it!! Sen. Arlen Specter, R-Pa., who threatened a congressional inquiry into the way the National Football League handled its "Spygate" investigation of the New England Patriots' videotaping practices, said he will not seek hearings on the matter, the Philadelphia Daily News reported. Specter, the ranking Republican on the Senate Judiciary Committee, has been critical of NFL commissioner Roger Goodell's investigation of the Patriots' taping of opposing team coaches' signals -- a practice violating NFL rules. But he told the newspaper's editorial board on Monday that "I've gone as far as I can" with his office's investigation of the matter. That’s because Commissioner Goodell did his job. PERIOD! As I’ve said many times, either coach Bill Belicheck genuinely didn’t know the rules or is the most arrogant human being in the world. Those are the only two logical explanations for videotaping an opponent who was coached by one of your former assistants. Regardless, the Pats franchise (and Belicheck himself) was severely punished, having been fined as well as losing draft picks. However, I didn’t feel justice was completely served since Belicheck was never suspended. Unfortunately, the conspiracy nuts will be as vocal as ever (especially in Pittsburgh, Philadelphia and St Louis). And as we found out, some of that overzealousness can lead to irresponsible reporting. In the end, there will be no Congressional investigations, there will be no asterisks next to the Patriots’ three Super Bowl titles and there will be no more mentions of this story at Pats headquarters. As an NFL fan, I’m just ready to get back to football! Certainly Jindal’s track record could energize the conservative base. But it seems he would be better suited to not tie himself to a sitting US Senator who was just as likely to vote with the Democrats as his own party. Besides, another four to eight years in the capacity of Governor of Louisiana would certainly hone Jindal’s experience in an executive position of government. As evidenced by four of our last five Presidents having been governors, the voting public often longs for Washington outsiders. Given that four years of an Obama presidency could resemble the Jimmy Carter faux pas of the late 70s (not that I’m hoping for that), a Jindal candidacy in 2012 may be analogous to the 1980 run of a certain Governor of California. As the gal & I were sifting through our VHS video tapes in preparation to move, I came across our wedding video that I hadn’t watched in a few years. Who knew that eight years later, that pleasant young man would accomplish a feat that was reached by only two others his age. Eighteen-year-old Jake Deitchler knew no one expected him to make the U.S. Olympic team. Only two other high school wrestlers had ever done so, and a person his age hadn't been on the team since 1976. Still, Deitchler wondered: What if? The three-time state champion from Anoka High School finished his senior year in April so he could train full-time, sweated in the wrestling room every day and came to the U.S. Olympic Trials thinking he had a chance. On Saturday, Deitchler pulled off an enormous upset in the challenge round of the 145.5-pound Greco- Roman division, then swept his opponent in the finals to earn a spot on the Olympic team. Although we haven’t seen Jake’s parents in a few years, I got to know them pretty well in the mid to late 90s. It is absolutely no surprise to me that Jake has accomplished all the things he has. His parents instilled in him a combination of a dream, work ethic and discipline that are rarely seen today in young people his age. And now that Jake Deitchler focus is going to be on the world stage this Summer for billions of people to see. With all the craziness taking place in life lately (i.e. the move, the gal’s Masters Degree work, long hours at my job, etc.) we decided to take a break in the action Friday evening. 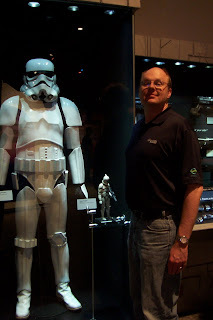 The Star Wars exhibit started at the Science Museum of Minnesota!! 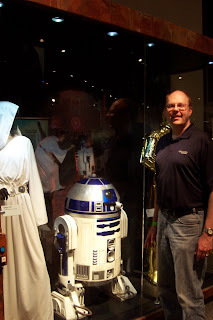 Featured were life size replicas of the characters, costumes and weapons. 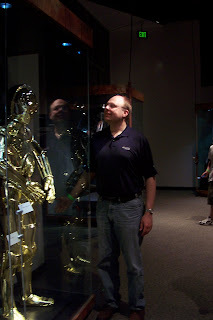 If you’re a Star Wars geek (like myself), I highly recommend checking it out before it ends on August 24! 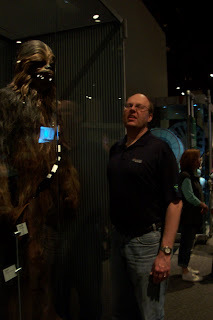 Man, that Chewbacca is tall! Aren't you a little short for a Storm Trooper? 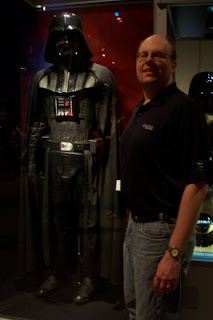 I could almost hear Darth Vader's ominous theme music while standing next to this replica. I had the privilege of reading Tim Russert's best selling book Big Russ & Me, a tribute to the lessons he learned from his beloved father. Back on June 10, 2004, Russert appeared on Rush Limbaugh's program to discuss the book. Tim Russert, NBC News’ Washington bureau chief and the moderator of “Meet the Press,” died Friday after a sudden heart attack at the bureau, NBC News said Friday. He was 58. Russert was recording voiceovers for Sunday’s “Meet the Press” program when he collapsed, the network said. No details were immediately available. Russert, the recipient of 48 honorary doctorates, took over the helm of “Meet the Press” in December 1991. Now in its 60th year, “Meet the Press” is the longest-running program in the history of television. In 2008, Time Magazine named him one of the 100 most influential people in the world. Timothy John Russert Jr. was born in Buffalo, N.Y., on May 7, 1950. He was a graduate of Canisius High School, John Carroll University and the Cleveland-Marshall College of Law. He was a member of the bar in New York and the District of Columbia. Regardless his left-leaning politics, Russert was one of the fairer interviewers of all the Sunday morning news shows. Now that Barack Obama is officially the Democrat nominee for President, his questionable associations will be even more heavily scrutinized. He will continually attempt to distance himself from his now former pastor, Rev. Jeremiah Wright. He can also dismiss his association with a radical (William Ayers) who said he didn’t regret participating in the bombings of New York City Police Headquarters in 1970, of the Capitol building in 1971, the Pentagon in 1972. And it remains to be seem whether or not Obama’s political favors for a recently convicted criminal will come back to haunt him. Of course, it would not be wise to underestimate the charismatic Obama. After all, he’s gotten within striking distance of the White House on little more than a slew of platitudes. But how will he distance himself from the comments made by the woman to whom he’s been married for over 15 years? In the past 18 months, Michelle Obama has made some of the more outlandish statements ever uttered by a potential First Lady. What a damning indictment of how she perceived America. I guess it shouldn’t have been surprising that she conveyed earlier this year that it was the first time in her adult lifetime that she was really proud of her country. That statement, of course, seems to be in direct conflict to what her husband said in his initial signature moment. 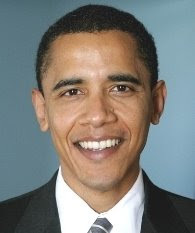 In Senator Obama’s speech at the 2004 Democratic National Convention, he talked of the United States as the place where an African immigrant married a Midwestern white woman and their son could go on to Harvard Law School and run for the U.S. Senate. “In no other country on earth, is my story even possible”, Obama said. The fact of the matter is if Michelle Obama is going to make public speeches, her words are going to be scrutinized. Apparently Senator Obama doesn’t think she should be held accountable for such rhetoric. Of course, he’ll have witting accomplices in the mainstream media who will construe any GOP criticism of Michelle’s words as misogynistic and racist. There are some who think it will be harder for America to accept a black first lady — the national hostess who serenely presides over the White House Christmas festivities and the Easter egg roll — than a black president. That’s a good preview of how Republicans will attack Michelle, suggesting that she does not share American values, mining a subtext of race. Sorry, but it’s not racist to strenuously object to a woman who states a man can be shot at a gas station simply because he’s black. And certainly no one is being demonized when they’re given examples of what has been great about this country since 1982 (the year Michelle Obama became a legal adult). Due to contractual obligations, for the present time I am unable to reveal why I am not currently hosting The Laura Ingraham Show. Rest assured, this absence is not of my choosing, nor is it health or family related. I am ready, willing and eager to continue the conversation we started seven years ago about politics and the culture. (Heck, if cancer couldn't keep me off the airwaves for long, nothing will.) Keep checking the site for a schedule of my appearances on the Fox News Channel. All queries regarding my on-air status should be directed to Talk Radio Network's management at 541 474 2297 or send an email. Thanks for sticking with me, and...Power to the People! Laura to appear on Fox News!! She will be hosting The O'Reilly Factor Friday, June 6 at 7:00 pm CT.
Just because I'm not on the radio right now doesn't mean I don't have a lot to say on politics and the culture. She then proceeded with some insightful commentary on the Obama-McCain race. ”She’s pretty well plugged in for being in the jungles of Africa”, I thought. But then she ended the message by saying to be sure and watch her on The O’Reilly Factor on Fox News this Friday evening. Now I started to get suspicious. She seemed pretty cryptic about her conspicuous absence from the radio airwaves. What’s going on??? After an unexplained radio absence and a cryptic message from one of her producers, speculation is building that syndicated radio talker Laura Ingraham may have at least temporarily stepped away from her program. It has been carried on hundreds of stations across the country. One theory is that there is some sort of contractual dispute with the Talk Radio Network, a syndication firm based in Oregon. Could Ingraham be ready to depart for another network, or move directly into television? I don’t watch O’Reilly’s show much, other than when Laura is guest-hosting. I think she’s a natural and would make, in my opinion, a seamless transition to TV if she were to leave radio. Hopefully this situation is resolved soon! Now more than ever we need an eloquent conservative voice amongst the media. Now that we have officially put our house up for sale, the major clean out has begun. Despite the fact we don’t have a very big house, we found ourselves amazed by how much junk we’ve accumulated. I even found pictures taken at a friend’s wedding back in November 1991. I mention that only because that was the venue where I met the woman whom I was once going to marry (we were engaged for five months back in 1992). There was even a couple of pictures of her amongst the lot. And here I thought I had burned every memento of our time together. Before banks started sending photo images of your checks written, they used to send the actual canceled checks along with the monthly statements. Turns out, I had saved checks going back to 1993. But I was most interested in the check register of July 1998. Sure enough, I had written a $19 check to Chili’s restaurant on July 11, 1998, the first date the gal and I ever had. Either prices were a heckuva a lot lower then or I was extremely cheap. As I was putting all of my old checks through the paper shredder, I decided to put aside that particular disbursement from 7/11/98. His appeal combines the political ability — alien to the Bush administration — to see something from your opponent’s point of view with the cool detachment of a J.F.K. He’s intriguingly imperfect: His ears stick out, he smokes, and he’s written about wrestling with pot, booze and “maybe a little blow” as a young man. Seven weeks later, upon finishing a speech in New Hampshire, Obama approached Dowd regarding the remarks in her column. "I just want to put you on notice,” Obama said. “I was teased relentlessly when I was a kid about my big ears." Of everything Dowd wrote in that paragraph, it was the remark about the ears that rankled him most. Lakers-Celtics: An NBA classic rivalry. With the L.A. Lakers and Boston Celtics beginning the NBA Finals this evening, I might actually tune in. But as far as I’m concerned, it didn’t get any better than the 1980s NBA when the Celtics and Lakers hooked up in the finals three different times. And my all-time favorite moment from that rivalry took place in Game 4 in 1987. The following clip is about 9 ½ minutes long, but the “Magic moment” takes place at about 7:04. Rumor has it that Hillary Clinton would consider the VP slot after all. I have my doubts that will take place. But let’s look at it hypothetically. Suppose an Obama-Clinton ticket wins it all this November. What of 2012? Naturally, Obama would run for re-election, right? Chances are a Vice President wouldn’t challenge a sitting President (although with the Clintons, all bets are off) for the party’s nomination. That means Hillary would not even be a contender for President again until 2016 when she will be 69-years old! Of course, I'm being facetious there. I have no idea what makes me think Hillary would ever invoke a Kennedy assassination as an analogy of how her Presidency could come to fruition.